SAVE2968, originally uploaded by bucklesw1. 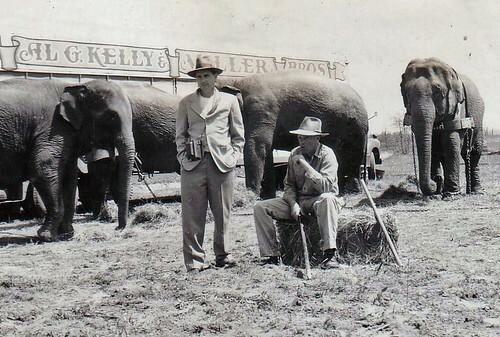 Kelly-Miller Circus 4/22/51 in Antlers , Okla. with John Beard with my dad sitting on a bale of hay, unusual picture since he was usually on the go. "Tena" in harness and at left is "Sally" that was later sold to Clyde Beatty in 1960 for his Florida Park and after that became the very first elephant at Busch Gardens in Tampa. Buckles: Today's pix and commentary are among the best you've run yet. Regarding it being unusual to see your dad sitting reminds me of a remark Shipley once made to me about a well-known elephant boss: "The first thing he does is send somebody to the truck for his chair so he can sit down." You probably recognize the subject. When Beatty's truck came through Hugo to pick up Sally, I believe they already had on board this Eleanor from the Muscatine, Iowa Zoo. Jim A said she originally came from the St Louis Zoo. Afterward she bounced around to several shows and didn't have a very successful show biz career under any of her names: Punky and Babe being two of these. As I mentioned before, Logan was down in Ocean Springs when we loaded Sally and it was a battle royal. I can't for the life of me remember a second elephant in that truck. I was a newlywed then and not quite myself. I know the one you are referring to, later with Little Bob Steven's Show, a pretty sorry specimen.